AIIMS MBBS result 2018 declared, check direct link here: AIIMS MBBS result 2018: The result of AIIMS MBBS 2018 entrance examination has been declared on June 18. Over two lakh candidates who have appeared for the examination can check the results through the official website, aiimsexams.org. The online examination was conducted in two shifts on May 26 and May 27. As per a note on the official website, the total numbers of candidates eligible for the mock round for the first round of seat allocation or online counselling are four times the actual number of seats advertised in each category. The mock round of seat allocation or the online counselling is expected to begin on June 23, 2018 followed by later rounds of counselling. The details will be available at http://www.aiimsexams.org very shortly. The offer letter of the successful candidates will be uploaded on the official website of the AIIMS entrance exam in some days. Candidates can download teh same from the official website. No individual letter will be sent by post. As per experts, the question paper was slightly towards the difficult side with physics being the toughest o the four (Biology, Chemistry, Physics, and General Knowledge). Other sections were moderately difficult and students who have covered all the topics should be scoring well I these three domains. The moderate levels of Chemistry, Physics, and GK is a good way to balance out the difficulties in the Physics domain. Physics saw a few questions which are quite challenging for the students and a major part of Chemistry dealt with organic chemistry. The counselling process will start in the month of July and the eligible candidates may apply online to choose their college of choices. Apart from the main centre in New Delhi which was established in 1956, there are six other colleges at various cities across India. The colleges are AIIMS Bhopal, AIIMS Bhubaneswar, AIIMS Jodhpur, AIIMS Patna, AIIMS Raipur, AIIMS Rishikesh. AIIMS MBBS 2018 Result: All India Institute of Medical Sciences, AIIMS is scheduled to declare the results of AIIMS MBBS Examination 2018 on the official website on June 18, 2018. As per Indian Express reports an AIIMS examination cell official confirmed, "The result of AIIMS MBBS 2018 examination will be declared on June 18 evening." The AIIMS MBBS 2018 Result would be released on the official website from 6 pm onwards. The counselling dates are not yet confirmed. 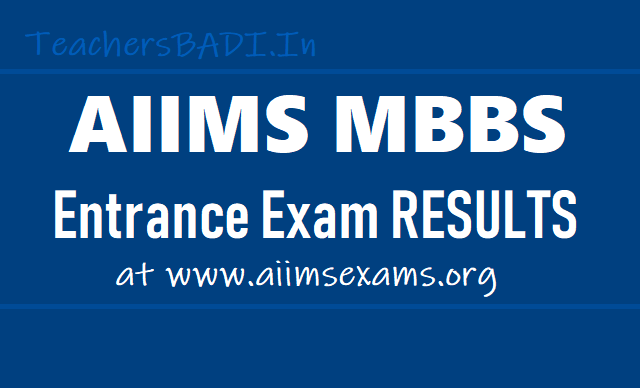 Students who appeared for the AIIMS MBBS Exam 2018 can check the results on - aiimsexams.org.The All India Institute of Medical Sciences, AIIMS entrance examination for admission to MBBS course was conducted on May 26 and May 27, 2018. The cut-off percentage last year for the General category was 50 per cent, while for OBC it was 45 per cent and for SC/ST it was 40 per cent.